The Right Brush is the right brush for all of your interior and exterior painting needs. This new and innovative product has an ergonomic, right angle handle that takes the stress off of your fingers and wrists while painting. The inventor, Mark Wholey, shares, “While putting a finish on a handmade coffee table, the brush I was using fell apart. I repaired it by wedging the handle at a right angle into the steel band. I completed the project with the ‘fixed’ brush and was amazed how comfortable it was to use.” Being a sculptor, Mark knows that form follows function. The Right Brush has ridges and depressions to improve the overall grip. A uniquely designed hook in the handle allows the brush to rest on the side of a paint can or even on a ladder; the brush bristles and your hands will always stay clean. With less finger and wrist fatigue, you can accomplish more in less time! The Right Brush is the right brush for all of your interior and exterior painting needs. Being a sculptor, Mark knows that form follows function. The Right Brush has ridges and depressions to improve the overall grip. 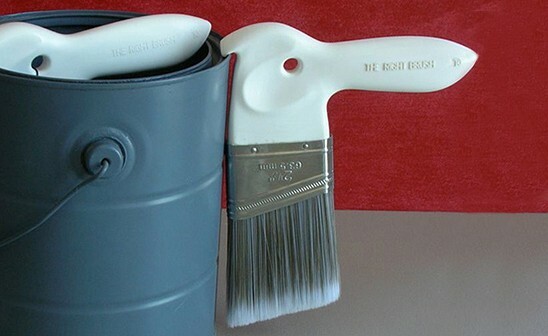 A uniquely designed hook in the handle allows the brush to rest on the side of a paint can or even on a ladder; the brush bristles and your hands will always stay clean.